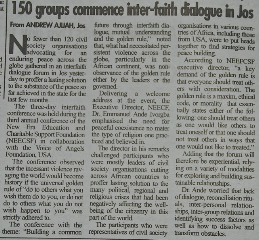 After reflecting on the urgent need for interfaith dialogue, role of religion to build peace and the teaching of the Golden Rule “Treat others the way you want to be treated” which is a common principles of different religions, indigenous cultures and secular philosophy is a fundamental principle that addresses and enhances mutual respect, human right, trust building, harmony and co-existence. The participants of the conference appreciate the President of Federal Republic of Nigeria, His Excellency Dr. Goodluck Jonathan for supporting the African Union Interfaith Dialogue Forum launched in June, 2010 in Abuja, Nigeria. We also thank and appreciate the African Union and the African Religious Leaders Council for taking the Initiative to launch the Forum. We call upon the religions leaders in northern Nigeria to engage actively their followers in the peace and reconciliation process and to work together to heal the wound and stops the cycle of violence and restore the mutual relationship and build trust between the religious divide in the area. We also call upon all concern bodies including the elders, traditional leaders, the media and women of both faith (Islam and Christian) to work actively in the process of reconciliation, forgiveness and peace building within the community. Tuesday evening Nov 1st, John and I met for dinner with Sani Suleiman of JDPC. 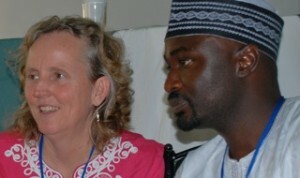 Sani is the coordinator and program director of Peace building and Conflict Transformation for the JDPC in Jos, Nigeria. He is a Muslim working for the Catholic organization. www.jdpcjos.org. Justice Development and Peace Commission/Caritas (JDPC) is responsible for social development activities in the Archdiocese. The JDPC serves all humanity regardless of religious or ethnic affiliation and is involved in different aspects of human development: Agriculture, Rural Water Supply, Human Rights/Legal Aid, Democracy Monitoring, Street Children (Under the Care for Children Programme), Prison Ministry, Women Empowerment and Conflict transformation/Peace building. Sani is a skilled moderator, peace builder, and has a regular radio presence in Jos. I met him in June at Eastern Mennonite University’s Summer Peacebuilding Institute (SPI) in Virginia. We were in the same class, Peacebuilding In Traumatized Societies and did a report together on the situation in Jos, Nigeria. We worked so well together that led to his participation in helping the facilitation of the Voices of Angels material during the Interfaith peace conference engaging the participants for two full days in “The 7 Principles of Reconciliation” (learned from Angeles Arrien and Patrick O’Neill). At our dinner when I asked straight out what he valued from the conference Oct 27-29, he said, “What amazed me was the process that engaged the individual’s heart but also the collective process.” He felt it was, “a very unique and important process.” He said it was new and that although he had been doing reconciliation work with a focus on perspectives of relationships he really learned. He said, “Apart from issues of personal transformation, connecting people and being a strong instrument of peace building, just this afternoon a participant from the conference called me and asked how I was doing. They were a stranger to me before the conference and now they are a friend. The conference provided space for sharing, learning and individual commitments.” He noted he observed my sensitivity in allowing him and Emmanuel to engage the people fully in ways that were culturally relevant. He concluded with, “You really challenged me and I wish to do the same with those whom I work.” I acknowledged his incredible skill in interactions with others while imparting the material of the principles. I was impressed by his flexibility adapting them spontaneously in culturally relevant ways, adding local moral teaching stories, adding movement, clapping, rhythm and humor. What joy he brings to the process while keeping all thoroughly engaged. What an honor to have worked with him. I asked him if he felt equipped to continue to process of engaging other in “The 7 Principles of Reconciliation” and he replied absolutely. They wanted to know my favorite Nigerian food and I told them chicken and jolof rice. They thought that was very fine!